One of the wildest revelations to come from the Nintendo business meeting today was its idea to break into a new venture, the health and fitness of video gamers and improving the quality of life through entertainment. President Satoru Iwata hit the podium today to answer for all of Nintendo's financial troubles over the previous year, taking a three second bow of shame to apologize, before leaping into Nintendo's future. Mario Kart 8, better integrated Nintendo Network ID, looser licensing deals on Mario, more integration between the 3DS and Wii U, and non-wearable health and fitness monitoring gear. Satoru Iwata claims that the idea is something entirely new to Nintendo, and it will plan to launch a new platform in 2015 to pursue this new business track. "I'm sure you're thinking of Wii Fit, but this is not like anything we have made before," Iwata said during the briefing. "Looking after your health requires effort and many people quit quite soon after starting something. But we, as an entertainment company, can help people get over the difficulty of continuing their efforts in a fun way." And the world continues to spin as it always does. Nintendo is making Mario while mysteriously promising the next big thing to come. This out-of-left-field idea isn't half as crazy as it sounds either. Wii Sports, Wii Fit, Punch Out!, Nintendo has always conquered when it gets involved in exercise and fitness, and more importantly, it conquers when appealing to a demographic besides gamers. Rather than trying to "dominate the living room" like Sony and Microsoft, Nintendo is looking "beyond the living room." So perfectly Nintendo, trying to be different. 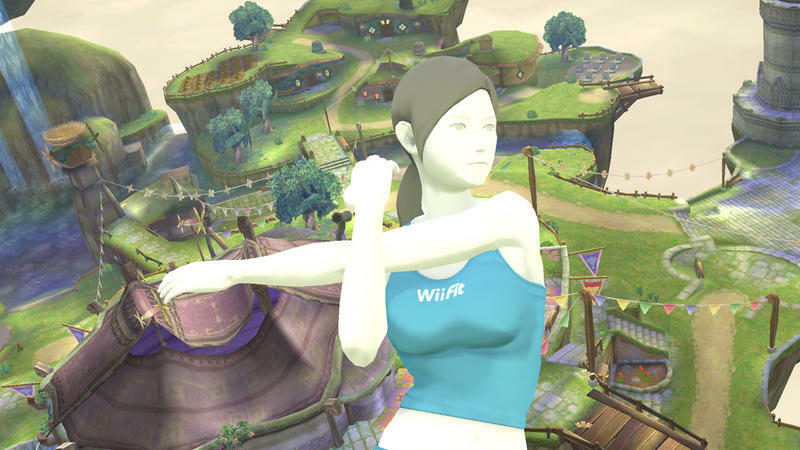 And now the inclusion of Wii Fit Trainer in Super Smash Bros. makes so much more sense. Just like Iwata said, I got into a good groove exercising last year, but dropped it due to my interest not holding out for more than a couple of months. I'd love to get back in, too. This is aimed right at me and all the other people in the world who are getting off their butts and exercising these days. How is Nintendo, the company which doomed me into an adolescence of anti-social behavior, going to get me out and about and back into jogging and lifting again? Call me crazy, but I'm excited. And it's just because Nintendo is doing what they always do.